Jason standing outside of the breezeway in Winter. If you’ve been in the store in the last two and a half years, the chances are good that you’ve met Jason. He is a staple here at Mountain Crossings. None of our staff really ascribe to position titles or any sort of hierarchy, but if we did, Jason would be the Store Manager. He encompasses that happy medium between ounce shaving, dirt bag hiker and operations minded businessman that makes him a very unique asset. And no matter which facet he is currently working with, all situations are handled in his signature laid back, logical, thoughtful and unhurried manner. Jason is the guy you want in charge when the world ends and that’s not only because of his excellent bow drill skills! Jason thru hiked the Appalachian Trail in 2008 leaving in mid February and reaching Katahdin in September. He had grown up traipsing around and camping in the mountains of North Georgia not far from the shop. The Blue Ridge Wildlife Management Area, which houses Springer Mountain and the first 20 or so miles of the Appalachian Trail, was a favorite weekend spot for Jason and his high school buddies. Thru hiking the AT taught Jason the importance of and the art of improvisation, he says. Of all the lessons he learned, the most outstanding was the ability to work with what he had on hand to complete whatever task may be at hand. A photo taken of a shakedown during the 2012 thru hiker season, Jason’s first months at Mountain Crossings. Jason’s kind and caring demeanor overflows into his business practices. He is a proponent of quality time spent and only necessary and quality items sold for the specific purposes of each individual customer. If a quick buck is made or a bad experience is had, he believes that the repercussions of these negative interactions travel further than just the walls of our store and affect more than just the customer directly involved. By striving for honest and friendly business, Jason encourages the entire MTX staff to build a more selfless and positive environment. 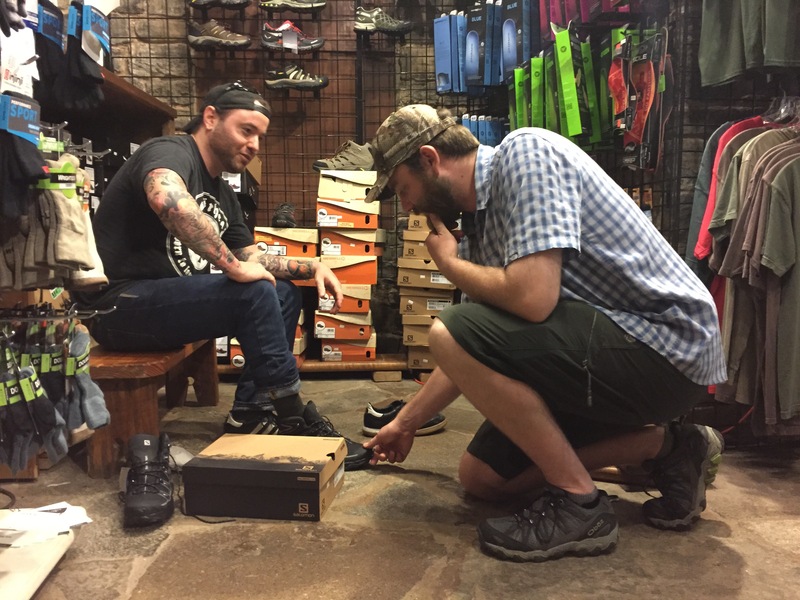 Sizing shoes is a serious thing at Mountain Crossings. Here, returning customer Zach is back for a new pair of Solomon Trail Runners and Jason checks him out for a good fitting. One of his favorite parts of working at Mountain Crossings is the ability to take someone in as a timid, beginner backpacker and help them grow into a seasoned veteran of the trail. Over his years he has been able to watch return customers transform from scared day hiker to mile crushing, trail machine. In my own early days of backpacking, I visited Mountain Crossings before my thru hike in 2013 and did a shakedown with Jason. I had never been out for more than a night on at a time on the trail and yet an hour with Jason culling through my over stuffed pack had me feeling more confident than I expected possible. When I finished the trail, I sent a post card to Mountain Crossings to thank Jason for his help and most for his encouragement, not knowing that one day I would be able to gaze at it as a pass by on a daily basis. 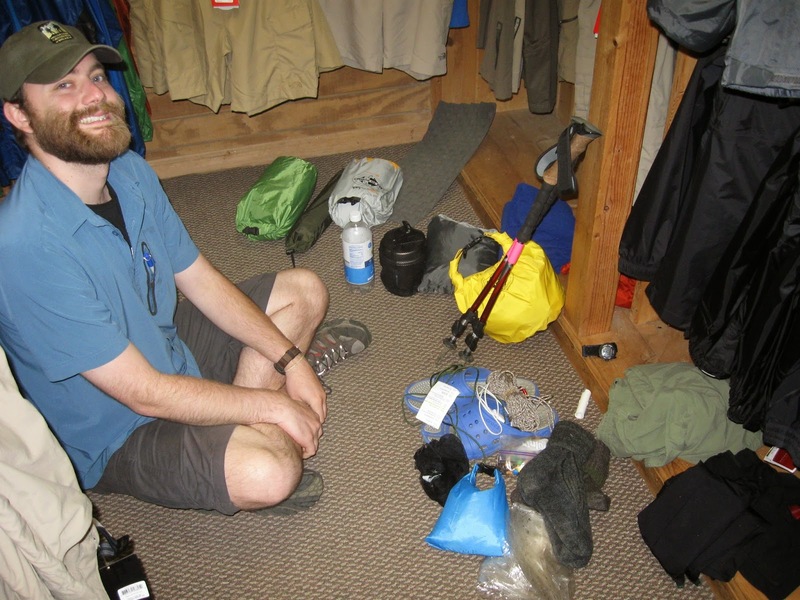 In thru hiker season Jason says he gives out two pieces of advice the most: 1) Treat your feet well and 2) Always readjust your pack. Too many people jump out of the starting gate and wear their feet down to nothing, he says, just because their muscles can handle it. A pair of happy feet is an important part of a successful thru hike. As far as packs go, many backpackers can go unfortunate lengths of time before they are properly fitted for a backpack or taught how to adjust the pack for maximum comfort. Jason enjoys easing the ride for hikers by teaching them how to properly use all the straps on their packs. 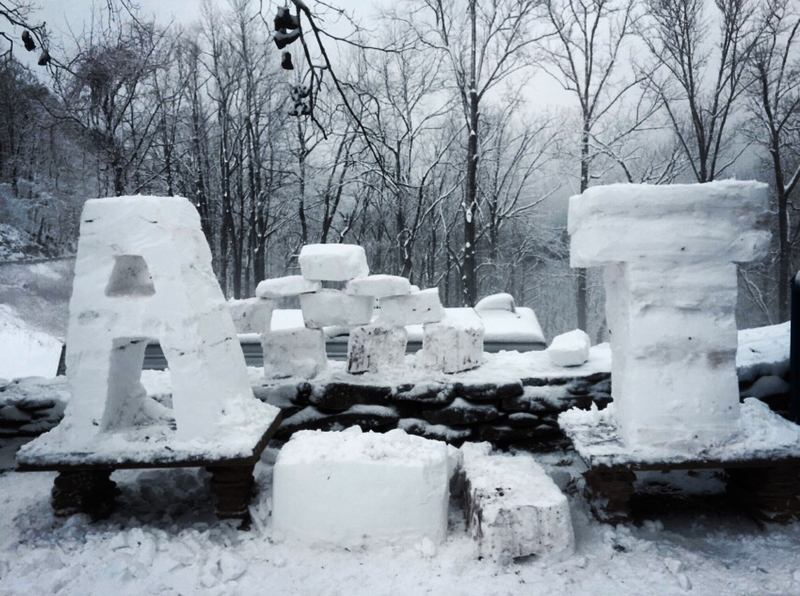 This is a snow scuplture made by Jason on a day off back in February after a nice snow storm rolled through. 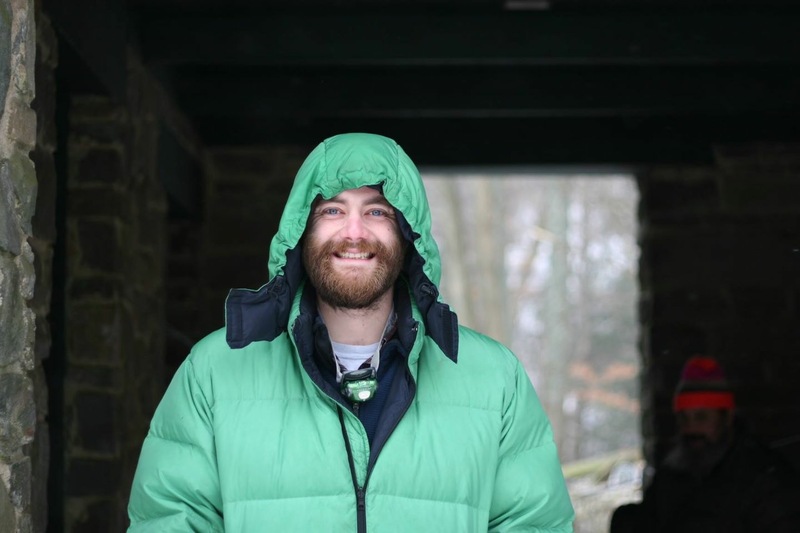 Jason’s existence at Mountain Crossings has had a very positive affect on innumerable hikers but none of it would have happened if backpacking hadn’t had such a huge affect on him. He says that when he realized he enjoyed hiking and backpacking as much as he did, he decided to stop more injury prone sports like skateboarding in an effort to elongate his life of hiking. “That’s the greatest thing about hiking. Anyone can do it and its something you can do later into your years as well,” Jason says. This entry was tagged appalachian Trail, Employee, hiking, Jason, mountain crossings, Neel Gap, Staff, Thru Hike. Backpacking. Bookmark the permalink.